Of all the cities in the world, London is my top pick for children because of the wealth of things to do in the UK’s capital, many of them free. Of course London can be expensive too, be ready for that, but the devalued pound and good exchange rates could help foreign visitors a lot. 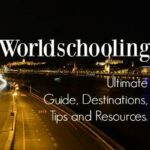 Some ideas, tips, reviews and guides on London with children, 2019 updated, some are my own childhood favourites, some are things and places my kids loved in London. Visiting London with children by a Londoner, a local, a returned expat and a full time professional traveller. 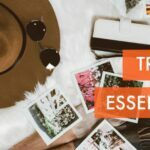 We returned to live in London for 8 months as part of our full-time nomadic travel lifestyle and we spend most summers there. Our children lived there as babies, toddlers, teens and tweens .We always love being back and London is a child’s paradise, it’s one of a handful of destinations that the kids always ask to return to. We know London like the back of our hands, so if we don’t cover anything here please feel free to ask in the comments. Visiting London With Kids, It’s a Dream Destination. London Attractions You Have to Pay For, But They’re Worth it! Visiting London with Kids in 2019 – Is it Safe? There is so much to do that is child friendly, educational and fun in London. There are parks and free museums, historical landmarks and entertainment, enough to keep your family busy for months, maybe years! I’ll stick to my family’s favourites, the things we always enjoyed when we lived in London years ago and the things we’re enjoying now, during our 8 month stay. If you are visiting London with children I hope you will enjoy them, too. I think the key to children getting the most out of travel is preparing them. Show them pictures, tell them stories, watch videos. When they get there they will be excited to see what London has to offer and know a bit about the landmarks. The tube system is fantastic, people love to hate it but it makes getting around so easy. Trains are regular, frequent and the city is well covered. Avoid peak hours, it can get very crowded and little people can get frightened in the crush. Take advantage of day passes which allow you to switch between buses and tube trains. A ride on the top of a London double-decker or a bendy bus is fun for the children. They may enjoy seeing the occasional mouse on the tube track, Oxford Circus and Leicester Square are good stations for spotting subterranean wildlife. by celebrity Anthea Turner and her sister, Wendy. 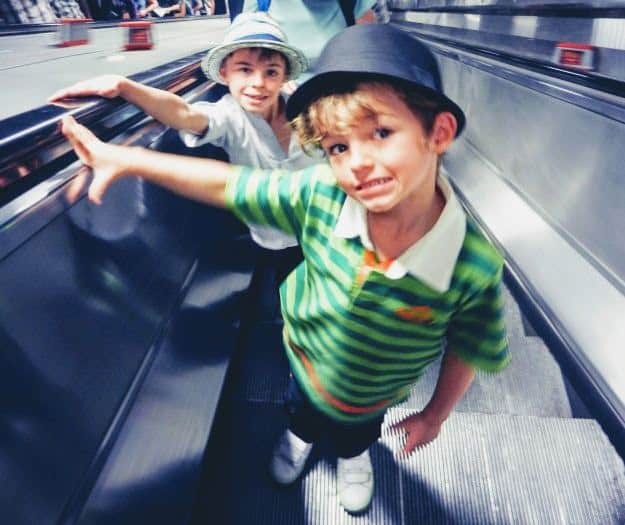 If you are a single Mum or Dad with children in strollers or buggies, there are a couple of tube stations wth steep stairs, no escalators or lifts. Strangers will almost always help you carry your buggy, plus child, up the steps. Londoners may not smile or chat much, but they like to help. London black taxis are everywhere, they aren’t cheap, just flag one down, they are metered. Bicycle Rickshaws are a new phenomenon I’ve taken one all the way from Covent Garden to the London Palladium. I didn’t realise it was so far, or that we’d be in heavy traffic on the Tottenham Court Rd. It was scary, but great fun. There were 2 adults and 2 children in our party and it cost about $20. I would stick to using them in areas with light traffic, they are popular around Soho. They have been criticised for being dangerous and uninsured. Maybe it’s a risk, but it was fun as a one-off. Boris Bikes as they’re called by the locals, are an initiative to get Londoners cycling. You’ll see stands of chunky-looking silver and blue bikes all over the capital. Cycle helmets are not a legal requirement in the UK, but take on the London traffic at your risk. I wouldn’t do it. They can be great for exploring the parks, particularly Hyde Park and Kensington Gardens, which interconnect. For 10 pounds you can use them as many times as you like for a week. ( half an hour each time). My 10 year old is big enough to ride them, my 8 year old isn’t. Most museums in London are free, which is brilliant! More and more you will see suggested donations, but these are not compulsory. As we visit these museums often, I may give a donation sometimes, others not. It’s one of the main things I miss about living in London, particularly as we are home educators or homeschoolers. London has a huge home education community. Expect queues and bag searches at most of the most popular museums. If you take your kids to the London Natural History Museum today you’re in for a surprise. Dippy the dinosaur has gone and in his place is this rather magnificent whale. Which do you prefer? You could spend a week here and still not see everything. It is incredible. 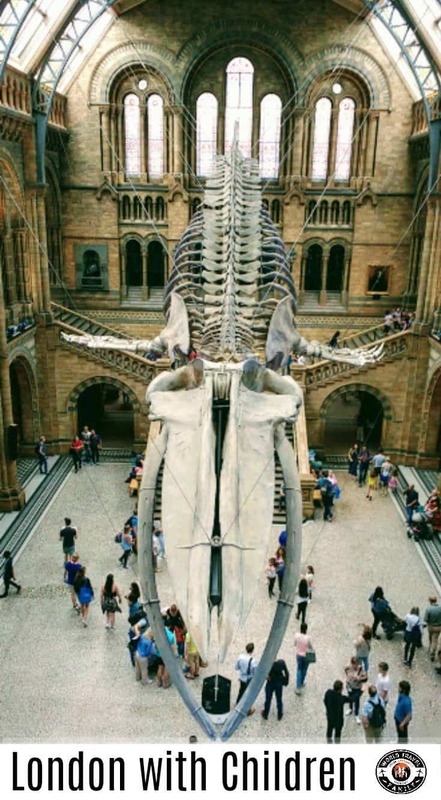 The building itself, with its magnificent Victorian architecture, is impressive, you step through the main doors and come face to face with a whale. Dippy, the iconic replica Diplodocus has gone on tour. To your left is the dinosaur exhibit, complete with an animatronic T Rex, huge skeletons and a number of interactive displays. Tip: The museum can be busy in term time, when many school groups visit, it has sometimes been quieter for us in school holidays, avoid weekends and go early or late. School holidays also bring huge crowds of course. You may have to queue outside. The mammal hall is spectacular, the life sized blue whale suspended from the ceiling is a memory from my childhood that still impresses me forty years later. There are cafes, excellent washrooms and cloakrooms. The food is extremely good quality, but more expensive than elsewhere. If you visit London at Christmas time you should find an outdoor ice rink and carousel in front of the museum. These photos were taken in November, the weather was beautiful and we didn’t need warm coats at all. We were lucky, you have to prepare for anything weather wise. I must also mention the Rothschild Collection out in Tring, north of London. It is now owned by the Natural History Museum, and is free. It is a compact yet extensive collection put together by Walter Rothschild, a notable eccentric, famous for having a stable of zebras to pull his carriage. They have the most enormous stuffed seal I have ever seen on the top floor, it’s well worth a visit. There is also The Horniman Museum at Dullwich or Forest Hill officially, again, a collection of stuffed animals from a private collection along with a small aquarium and butterfly exhibit. The 2010 BBC TV documentary series, The Museum of Life, is one of our family favourites. It’s a behind the scenes look at the work the NHM does, it would be great to watch before you go if you can. 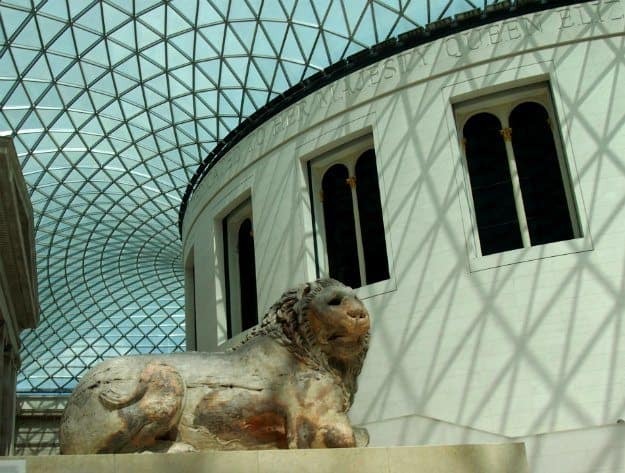 London’s British Museum, a stunning collection in a stunning building. Travel through time and history with your kids. At the British Museum the Egyptian artifacts are amazing, not as good as Cairo’s Egyptian Museum and, arguably, some of the exhibits should be sent back there, but if you are into Egyptology, mummies and hieroglyphs you will be in museum heaven. They have the Rosetta stone, how cool is that? Just about every culture is represented, from Ancient Greece to Asian civilizations, Egypt is our family favorite. We’re always on the lookout for educational things to do in London and the British Museum’s kids audio guides are superb. It’s an incredible building with good facilities, food is great, but pricey, washrooms are good but they can get very busy. I really like the gift shop too with products from the arty and unique to kids books and toys. 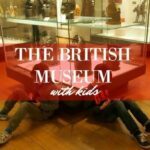 Read our full post on the British Museum with children here. Hands on kids’ science at the Launchpad Kids Area of London’s Science Museum. It’s free to enter but donations are appreciated. London’s Science Museum is right next door to the Natural History museum and is also free to enter ( other than by donation). There are two hands-on kids’ science areas, one for toddlers, preschoolers and young school aged kids on the bottom floor and one for older kids ( shown above). 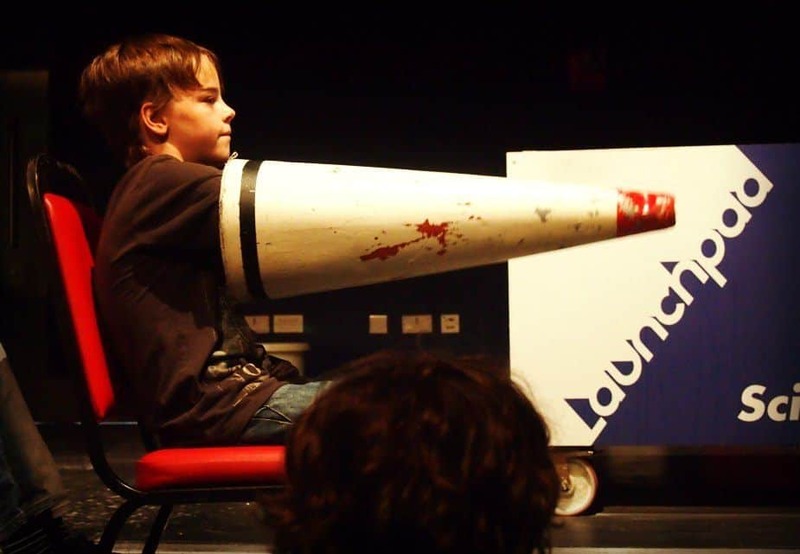 Launchpad is on the top floor and has plenty to keep kids busy including science shows and demonstrations throughout the day. Read more on London Science Museum with children here. The Science Museum is often less crowded, so if you can’t face the Natural History Museum queues you can try here instead, or even the Victoria and Albert museum which is just over the road. The big three are in South Kensington, you need South Kensington Tube Station then take the underground walkway to the museums. The V& A, the Victorial and Albert Museum of art and design is my kids’ least favourite of the big 3 London Museums. I really like the display of theatrical and celebrity musicians’ costumes on the top floor. There is also an area to play dress up but the clother tend towards adult size. On a lower floor there are interesting exhibits on art and design around the world and religious art styles. There are audio guides available. The cafe in the V&A is pretty spectacular. In this area of London look out for WW2 damage to the stonework, it’s everywhere. If the Natural History and Science Museums are looking way too busy, the V & A is usually quieter. There are 2 changing of the guard ceremonies that attract tourists, the bigger one at Buckingham Palace and the smaller at Horse Guards Parade in Whitehall. Both are, in theory, daily and at 11 am. The Buckingham Palace Ceremony starts at 10.30am when the new guard forms at Welligton Baracks ( opposite St James’s Park). They then march to Buckingham Palace and ” change” at 11 am. The old guard then marches back to barracks with accompanying band. They are back at barracks at 11.30am. You need to check timetables as there are seasonal, weather and security variations. Try here. It is at Whitehall ( near Downing St.) that you can get a photo with a mounted guardsman and stroke a horse, if you’re lucky. The Queens Guard at Whitehall changes at 10 am on Sundays, but do check and double check these times. Beautiful, historic Greenwich. Run down the hill, or roll if you prefer. Stand on the meridian line ( it’s free) . Visit the Cutty Sark or the Maritime Museum . Greenwich is well worth your time. Greenwich isn’t far away at all but because it’s a stand alone area, reached by the Docklands Light Rail. we’ll keep it separate. 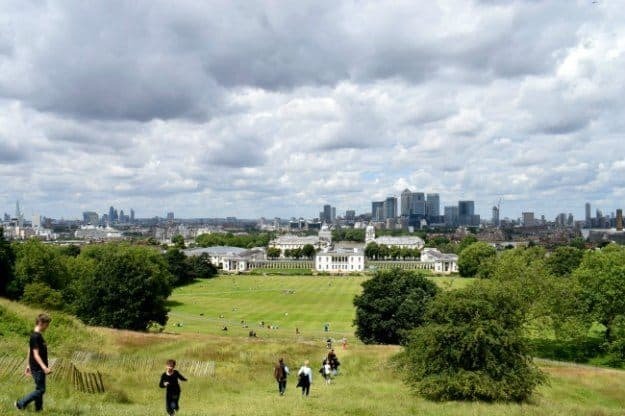 There is plenty to fill a day or two in Greenwich and it’s one of our favourite parts of London. We often stay on this side of town too. Greenwich is dominated by the magnificent The Cutty Sark , a paid attraction, but there are free museums, the Greenwich Meridian and wonderful markets, traditional pie mash and jellied eels and modern street food to explore. See our post on things to do in Greenwich with children. This post includes information on how to get to Greenwich. It’s worth a visit just for the food hall, an amazing array of the unusual and the expensive, plenty of eating opportunities here too, at a price. There is a dress code, they don’t admit scruffs. If you’re visiting London with children of any age ( even those in need of a hair cut!) you MUST visit Hamleys the Greatest Toy Store in the World. There’s something for everyone, entertainments and toys to try. They even have a rope-drop style event at opening time. Maybe the greatest toy shop in the world. It’s on Regent St. just a short walk from Oxford Circus. There are five floors of awesomeness with lifts and escalators. A cafe, restrooms and baby changing facilities are on the top floor along with the Dr Who toys (wow!). Staff stationed all over the shop keep kids entertained with toy demonstrations. The window displays at Christmas make things extra magical. The Covent Garden tube station is strange, it’s the only station I remember where the access is via elevators. As you come out and walk right towards Covent Garden you are surrounded by buskers, mostly performance artists standing still pretending to be statues, waiting for you to throw them coins. They are extremely good, most kids love them. In Covent Garden proper you will find more buskers, these are more likely to put on shows, gathering a crowd around them, again, they are excellent, magic, fire tricks, uni-cyclists, jugglers or, my favourite the guy that puts on the Charlie Chaplin show. My son got involved with him last year, it was amazing. They usually pass a hat round for donations at the end. In the central part of the market are the market stalls, surrounding this are regular high street shops housed in the old market buildings. I LOVE Covent Garden. Look out for the Christmas fairs and food fairs, there are often special events. Borough market is another Harry Potter filming location ( The Leaky Cauldron is here) and is a foodie destination above all others. Beware, it can get very crowded on weekends and during holidays. Borough Market dates back to 1041 and is open Monday to Saturday although Monday and Tuesday are smaller market days, not all traders open then. It is likely to be closed on public ( bank) holidays. It is on the South Bank, beneath London Bridge, near The Shard and London Bridge Experience / London Tombs. Around Christmas Borough Market is also open on some Sundays. London is absolutely crammed with parks, lakes and playgrounds, the wild squirrel population is a big hit with those that aren’t used to them. My husband and I used to laugh at tourists taking photos of the squirrels, now my children chase them around with cameras, too. You will find them wherever there is grass and trees. This is a must do for anyone visiting London with children. The Princess Diana memorial playground in Kensington Gardens is a fantasy land, very much inspired by Peter Pan, for children up to about 12. It is a safe, fenched area for families only. The Princess Diana playground is a magical place, a lovely reminder of a special lady. 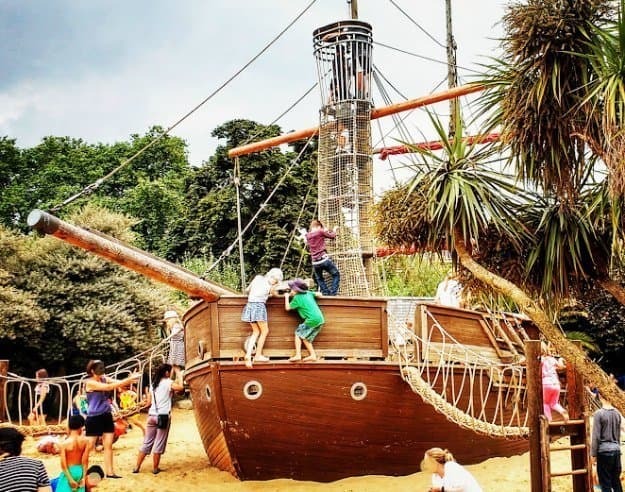 It is only open to children under 12, and features a huge central pirate ship. You can find it near her old home in Kensington Gardens. The Diana memorial fountain is in Hyde Park, the two parks are side by side. The fountain is another lovely spot, children and adults like to paddle on hot days. You can see some of the zoo animals for free from Regents park, certainly the camels in the old, listed, elephant building and the farmyard animals in the petting zoo. It’s an enormous area of grass and gardens, take the kids for a run around, to feed the ducks or for a rowing boat ride on the lake. It is beautiful in autumn when the leaves are turning. There are a number of cafes serving ice creams, cakes and hot snacks along with rest room facilities. At the Baker St end there is a really great kids’ playground. St James’s Park is the park you’ll walk through between Horse Guards’ Parade and Buckingham Palace. It has a lake, plenty of ducks and swans and a really nice kids’ playground just steps from Buckingham Palace. This would be a good place to take a kid friendly breather before or after the changing of the guard. There is a café near the lake. Working on this section today! Last week I took my son to the London Tombs and Tower Bridge Experience for his birthday. Before we went we found a price of around 15 pounds on a ticket and tour booking site. The cost of the same ticket on the attraction’s own website was 19 pounds something. We couldn’t believe that the tour website had a better price than the attraction itself so we turned up thinking we’d pay on the door. The price there was a huge 27 pounds! Almost double what we’d pay for our family using this tour booking company. Click through, check the prices. See if you can save yourself time and money by booking smart, in advance. They have tickets for just about every attraction in London as well as a whole bunch of tours and experiences. London Zoo is a big day out, a must-do if you are visiting London with children. I used to take my preschoolers almost every week on our local’s annual pass. Unfortunately, it is a little expensive for one-off visitors. You can see my post on London Zoo here, I’m a zoologist and passionate about animal welfare, the work they do is vital for conservation and London is a shining example of this. Check out the old elephant house, a listed building, the elephants have now been relocated to Whipsnade Zoo and Safari Park, along with the other larger mammals. ( Whipsnade is also excellent) The elephant house was housing camels and pygmy hippos last time I was there. The cafe at London zoo has a good selection of hot food and healthy snacks, they do a great coffee and cake too. It does get very busy, try to avoid peak times. Check out the area in front of the cafe for carousels, occasional face painting and a lovely children’s playground. The giraffe house is another favourite I love the smell of giraffe and hay as you go into the enclosed area. We used to take a packed lunch and eat it in the giraffe house, sometimes. I’ve been visiting London zoo all my life, things have changed, there are new attractions, ( such as the excellent indoor rain forest exhibit) but the old buildings and history remain. The reptile house is another old building, if you know your Harry Potter films you’ll recognize the enclosure at the front, on the left, as the place where Harry first started talking to snakes. The London Sea Life Centre on the South Bank is a place my kids have been visiting since they were toddlers. It’s a great aquarium with plenty of sharks, the kids ask to go again and again. This is a great aquarium, the huge shark tank stretched over 2 or 3 stories and housed some unusual types of shark, not just the usual grey nurse sharks. 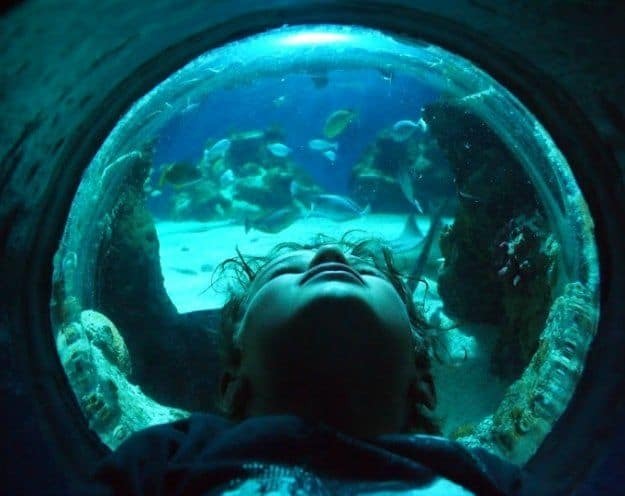 You can read our review of London Aquarium here. It’s just south of the river near the London Eye (one of the very best attractions in London), you could do both in one day and save money by buying a Combi Ticket. There is a great kids’ playground near The Eye on the South Bank too. Another big day out, highlights include King Henry VIII’s suit of amour and the crown jewels When I was visiting last year they had a special exhibition, Royal Beasts, showcasing the tower’s history as a zoo, complete with wandering actors re-enacting the roles of the beast keepers. It’s still running. It was a big hit with the kids, as were the ghostly tales of the Beefeaters. These guys are all ex-army, are great with the kids, and tell fantastic tales. This is one of my favourites and is where you see just how small London is, you can see everything from up there, I’ve not taken the children since they were babies, I have a feeling children may find it a little dull, this one is more for the grown ups. The Shard is a building on London’s South Bank, not far from London Bridge. It has 95 floors and is 310 m tall. Visitors can go to the upper viewing decks to take in the incredible views as part of a ” View From the Shard” package. I’ve been up there with my kids, they loved it. I’m scared of heights so was fairly terrified but the view was immense. This would probably be a good alternative to The London Eye. We have our full post on going up The Shard here. Doctor Who fans might get a particular buzz out of this one as Matt Smith’s Doctor once went up the Shard on a motorbike. The London Ripley’s Believe it or Not is housed in a building overlooking Piccadilly Circus and yes, for a fun half day, it’s well worth going. My kids adored this place just as they loved the New York Ripley’s, the two are quite different. They particularly enjoyed the lazer maze, which you can pay to enter in isolation. A full post on London Ripley’s Believe it or Not here. UPDATE – This Ripley’s I believe, has now gone, I’m trying to find out more. I haven’t been to Tussauds since I was a child and have never taken my kids. They wouldn’t know who most of the celebrities were as we’re not TV watchers so I didn’t see the point. My brother and I loved it back then, particularly the horrible Chamber of Horrors. Sorry, I don’t know what it’s like now! It’s next to Baker St Tube station which is where you’ll come for the Sherlock Holmes museum. Last time I was here the gift shop next door to the tube station had a full sized TARDIS just inside, handy for photo ops! This attraction is horrible and nasty in a good way, all the gruesome gory bits from London’s history. Small boys and my husband love this stuff. I’m not such a fan, I really don’t need to hear about medieval torture methods, thanks very much, they did a great job of making me feel quite ill with stories of red-hot tongue clamps. 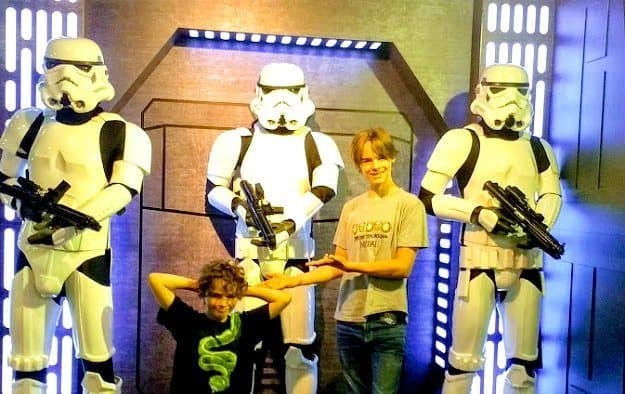 The actor led tours are superb, some new rides have opened since my last visit, this is another place we will visit next time, the boys will be old enough then. You could call it educational, its history, Jack the Ripper, the plague and the great fire should be part of every child’s education. If your kids like their history horrible, they’ll love this. If you enjoy this sort of thing you could also check out the tour at The Clink prison. One of the oldest prisons in London, it gave its name to all others. It’s on the South Bank. My husband and I found it interesting, but I think for the older children, the London Dungeon would be more fun. Another scare-fest built beneath London Bridge. Partly educational, partly a straight up scare attraction, it’s fun for kids. Maybe wait until they are 10-11 years old because it’s a little freaky. We enjoyed it but see the note above about ticket prices. We have Chessington World of Adventure, Legoland Windsor and Thorpe Park. I should also mention Go Ape, they have one of their zip line and ropes courses at Chessington. I have taken the children to The London Palladium to see The Wizard of Oz and to the Lyceum to see The Lion King. After much online research, we found that the cheapest way to buy tickets was to actually go along to the theater’s box office and be very nice to the man behind the desk, we got tickets for that night at the Palladium and a free ticket for my youngest, their Granny got her ticket half price as an OAP. Both were evening shows, finishing late at night, we had no issues with tiredness and fidgeting because they were so mesmerized by the performances and the theatrical wizardry going on (indoor snow and a witch flying above the audience). If you want to see the Harry Potter Show- Harry Potter and the Cursed Child an the Palace Theatre in the West End- ( it’s actually 2 shows), book well in advance, months, and it would be helpful to win the lottery. It’s insanely expensive. For the 4 of us we were looking at almost $1000 for both shows last summer. So we saw The Lion King instead. Whichever way you look at it, London is going to cost you a fair bit for accommodation. A cheap stay would be something in the region of £50 -£100 per night and you’d have to be very smart and have small children to find anything at the £50 end. You will probably pay a lot more. We recommend you start your search with Hotels Combined , this online comparison site checks multiple online accommodation providers simultaneously to find the best deal for your dates. Agoda are the Asia specialists, but we do sometimes use them in Europe, Hotels Combined does not check Agoda , so take a look separately. Booking.com is a typical booking agent for the UK and Europe, they’re excellent for fully refundable deals. It’s also worth checking AirBnb for London, big European cities are one of the few places we have success with using this method of booking. If you sign up using our link you will receive an AirBnB credit. I’m in London today, summer 2018 and I feel completely safe in the city. We’ve had a few unfortunate incidents lately but they were confined to gangs and fighting within those gangs, it seems. I am more cautious today about theft in the city and I wouldn’t wander around with my phone in my hand since scooter theft has become more and more common, but otherwise, yes, I feel very safe here and have no issues with taking my kids into London. Take a look at our anti theft techniques, bags and devices here. There are pickpockets, but it’s never happened to us. I worked in the city every day for 5 years, I took my kids in every weekend, nothing bad ever happened. A reader asked for ideas, ideally lower cost ideas, for tours you can take from London with kids. So I started looking. The Harry Potter Studios are about 30 miles from central London. This is an absolute must-do for any Potter fan. I actually cried tears of motherly joy as my boys opened the doors to the Great Hall. They’re teens now and still ask to go back. We will, soon. You can self drive out to the Warner Bros Studios or book a tour that departs London here. Stonehenge is 87 miles, 140 Km south west from London. At Stonehenge today you will find a modern visitor’s centre with exhibions, a shop, café, neolithic houses and the stones themselves nearby. I’ve never been to the new Stonehenge visitors’ centre, I’ve only ever seen Stonehenge from the road, but there are many and varied tours that will take you from London to Stonehenge and back in a day. They can also include other destinations such as Bath, Windsor and Oxford. Check these tours out here. Oxford is 83Km ( 52 miles ) from London and can be reached by train, bus, coach, road or tour. Oxford is a popular destination for lovers of history, archetecture, Downton Abbey and Harry Potter. If you don’t have your own vehicle consider booking a tour to Oxford from London. Investigate your options here. These tours include Harry Potter tours. If you’re very short of time you can even see Oxford, The Cotswolds and Stratford – Upon – Avon ( Shakespeare’s Birthplace) in one day. The Cotswolds are around 90 miles from London, beyond Oxford to the north west. You can book tours from London to the picturesque Cotswold villages. Most tours will include London or Stratford. I don’t think this sort of sight seeing would be particularly great with kids. See tours here. But if you’re heading to the Cotswolds we can recommend a couple of places for them. There are endless options when you are visiting London with children, just take a walk along the river, better still, take a cruise, get out of London, visit Richmond Park and see the herds of wild deer or visit the Botanical Gardens at Kew, their indoor soft play area is brilliant. If you are heading to London and need any help, drop me a comment, I’d be happy to help you out with anything child related, both my children were born there, we had a lot of fun. Back to our main London Family Travel Blog page. 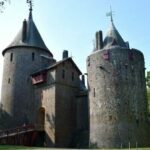 or maybe back to our main UK Travel Blog page. hi, thanks for such an informative post. I will be visiting London, Edinburgh and Belfast in June with my wife and 5 1/2 year old kid. I have a dilemma whether to take along stroller or not for my kid. your suggestion in this regard will help me out. 5 and a half is quite old to still be using a stroller. I’d say that they’re certainly useful when travelling though because 5 and a half year olds are heavy! You will probably want to walk further than she can manage, she may be able to nap in the stroller and so on. So if she still uses it, it will be more useful to you when travelling than it is at home. But if she doesn’t use it at home or doesn’t like using a stroller, no, don’t take it. It is quite a hike Doli ! We always walk accross Regent’s Park tube or you can walk from I think Primrose Hill is the closest over that side ? There is a bus or buses that will get you closer but we always used to walk through the park so I don’t know off the top of my head sorry. If you walk from Baker St tube there’s the lake and a nice kids playground and tea rooms to break the walk up, or you could cross from the tube station at the opposite end of Regents Park through all the lovely flower gardens. It’s a big day for little legs. The restaurant in the zoo is very good, but expensive, so pack some sandwiches and go eat with the giraffes. You could easily spend a full day there, half a day if you bomb around. Go when it’s quiet not on weekends and try to get there early. I think they have a new batch of tiger cubs there now. hi your blog is fantasic. i have been referring to uour blog since day fr planning my itinerary. though i would like to know how about some one day tour to cotswold . ones online are super expensive. also suggest sites which offer cheap tockets to londoz zoo aquarium etc. OK, I’ll work on this page today and see what I can find. Woyld you come back in a few hours? Thanks for the ideas, they’re great! Thanks for the post. I’m getting my four year old daughter to London for the first time this summer. I see many parents carrying baby buggies. I want to know, is it compulsory to use buggy for kids here? Can they just walk around? 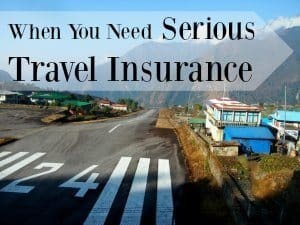 Can we, the parents, carry the kids and travel? Can we drive rented cars without UK driving license? What precautions required to carry a kid in the car? It will be great if u can answer. No, buggies aren’t compulsory! Of course they can walk or be carried. I think parents like the extra speed and ease of having little ones in a buggy and it keeps them a bit safer . They’ll be on crowds, near traffic and so on. On the tube, if you have to stand, it could be difficult as you’ll need on hand to hold on to something. If you’re just getting a taxi you don’t have to have a car seat. No you do not need a UK driving license but you may need an international driving license, or at least a license in English. Check regulations for your particular country. If you’re renting a car you can normally rent a suitable car seat with the car. Kids right up to, maybe 10 years old ( it depends on weight and height) need a car seat of some sort, but if the vehicle isn’t yours, if somebody is just giving you a lift, it should be OK, but check. I’ll find a link and add it to this page. Thanks for the tips! We live in the Netherlands and brought the kids to London 2 years ago at age 3 and 5. Stayed outside the city centre in a simple family room and went out to explore the city for 3 whole days. Love the fact that public transport and museums are free for kids. We are going back in a few weeks (kids are now 6 and almost 8) and we already have lots of plans. One thing we can’t really find is a high tea experience that is affordable… We’d love to show them also some food culture and besides the typical english breakfasts we thought they would enjoy a high tea. All the ones I can find online a quite luxurious and about 50 pounds each .. Any tips on that subject? Thanks for your help! I have never, in my whole life, had a high tea. So sorry, can’t help! Could you just do a cream tea instead. Scones, jam and clotted cream? That would be cheaper and very British. Have a google for tea rooms rather than hotels that offer high teas maybe. Thanks! That would be just as good, will check! thank you for this article! we just found a great deal on direct flights to london, but i’m afraid we are making a huge mistake taking our 1.5 year old! Why on Earth would you think that ? we are flying from Michigan so we are terrified of the flight. And the time change for him. And there being enough stuff for a one-and-a-half-year-old to do there. I’ve always wanted to go to London but I’m hoping we’re not pushing it too quickly with o toddler. I know my four-and-a-half-year-old is going to love it! I don’t know? What do 1 and a half year olds do? Playgrounds? The zoo ? Loads of that stuff. But you won’t want to spend too much of your precious time hanging around playgrounds, but you must see the Princess Diana Memorial Playground, that’s cool. Lots of swans and ducks to feed, parakeets to look at ( did you know we have wild parakeets in London?) Horses to stroke at the changing of the guard. Take him to Hamleys. But the zoo is by far my favourite. We used to take ours there every weekend for a run around in Regents Park too. I took both of mine to Australia from London at 11 months and the time thing was fine, but be prepared for waking up right through the night and not getting much sleep at first. 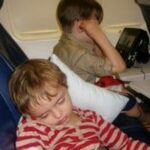 My younger one, when he was about 4, had vomiting through jetlag, again on the Australia-London route. Considering a trip from the US in March 2019 with our 13 and 11 yr olds. As for accommodations we are considering finding an Airbnb/Homeaway/VRBO. Advice on neighborhoods to stay in? Priorities would be safety, ease of transportation to sites around the city, and the feeling of being in another place…we would prefer not to feel like we’re in just another US city if that makes sense! Do you want to be in Central London, on the tube line, within walking distance, an hour out of town etc? Also how much do you want to spend per day on accommodation because that will be your deciding factor really. I’d love to know the answer to this as well. I’m planing a month in England this summer with my 9 & 12 year old and we are starting our journey in London. Ideally, We would stay near Heathrow the first night, but afterwards relocating in central London. Knowing which (safe) neighborhood(s) you recommend for ease of travel to tube stations and or bus stop would be immensely helpful in planning. For us, clean, safe, and within walking distance to restaurants would be priority. Would you recommend renting an Airbnb type accommodation or hotel, the cheaper the better? It’s really impossible to advise like that Megan, but I’d say that near a tube station was pretty essential. Of course that immediately puts your price up. We’re very fond of Richmond on Thames, possibly the nicest place to stay, but expensive. Right on the end of the District line, so still a trek into town but you also have beautiful Richmond to enjoy. There are 11 tube lines and 270 stations, so you just can’t pick one. I’d say, go to AirBnb, zoon right in close to the map and see what’s available in your price range for your dates. If you see anything promising come back and ask me what the area is like. We’ve had success with Airbnb a couple of times, but you have to get lucky. Greenwich is a lovely area, another favourite, but a way out of central London. If you want to be in the heart of town, the West End or near Regents Park, Kensington, that sort of thing, I imagine it will cost you a lot. We did once have a brilliant AirBnb appartment right om Oxford St and by some miracle it was cheap. Just see what you can find. There are a lot of cheap apartment type hotels in the big old houses of West Kensington, that can be a good area to look. Or maybe Earls Court. There are some hostels there including a YHA and some cheap hotels. Love it! I spent a sleepless weekend in London back in 2009 when I first visited it. I’d love to go back and do everything that you have mentioned in your post. Thank you for your blog! Very helpful! We were considering coming in March. Would the weather accommodate all the outdoor fun you mentioned? Also, we are a little worried about jet lag with our 4 and 6 year old. Can you help how you helped them adjust? Thank you! March is normally pretty nice, certainly not cold. It might rain, but who knows? Jetlag isn’t something that we’ve really even had many problems with. You just reset your watch when you get on the plane and carry on in your new time zone, fully switching when you are on the plane. You may be a bit tired and back to front for a day or so but it’s not really a very big deal. Try and only let them sleep and eat at the “appropriate” time in your new time zone, but obviously, with little ones you may have to allow some naps. My two fall asleep on buses and tubes almost every time, still at 14 and 12, so naps just happen. Feed and water them often. Should be fine. That is a great guide. We will be in London next month and it will be the first time with kids and fifteen years since we have been there. Unfortunately we only have a few days. Not nearly long enough. Do you recommend pre booking the Tower of London? don’t think I did last time but that was a long time ago. I’d have a look at prices online. We booked tickets online recently ( for another London attraction) and they were half the price of paying on the door. Seriously…half! Use the GetYourGuide link in the post. Wow what a super list! Looking to return now the kids are older and the list just keeps growing and growing. Love that the museums remain free. Hey, I have never been London but now I am Planning a trip to London with my family. The places you suggested is sound very amazing to visit and i am sure my kids are going to love these places and i am definitely going to visit these places for sure.Thank you. Thanks for this – I am pinning it for later (I hope! we’ll see how it turns out…). We lived there for three years but it was pre-kids so I’m a little out of touch with that kind of detail. Hi Bronwyn, this is an ancient post, written before our current stay in London, I’ll b updating shortly with all the new tops, ideas and attractions we’ve discovered. Bridge over to St Paul’s and have a picnic in the gardens, free entry, they’re not huge, but its a small green spot to sit the kids down. There is a shopping centre near St Paul’s, and if you take the lift to the top there is a terrace area, free to gain entry, with more spectacular views- there is a bar and restaurant at the top if you’re feeling flush. There is a Museum of Childhood in Bethnal Green, not huge, but funny, especially if you can take a grandparent too, show the kids what you used to play with and what granny used to play with, they’ll be amazed!! There is a museum in the City about the Bank of England, again not huge but free, and the kids liked seeing all the old money. The Changing of the Guards is a great spectacle for kids to see, last time we went we stood outside St James’s Palace as tats where the band come from, and the crowds are less and they’ll also play a few songs before marching off to the Palace, then you can nip through St James’s park and see the band arrive at he Barracks. Thanks Keryn and Jessica, I really love London, I hope it shows. I’m a Welsh girl but London is very special to me and the children, they have the best time there. Great list! I’ve got my final list coming out on Wednesday, but you covered a lot of things I didn’t. I’ll just have to add them to our trip itinerary when we head back! What a great list! We’ve been to London twice and we still haven’t seen all of these. Thanks for sharing! I am so glad you pointed this article out to me! My boys are so excited about The London Dungeon – they’re read about it and really just want to go there and to Hamley’s. They will be in heaven if that’s all we do. On the other hand, I am really looking forward to Covent Garden Markets and The British Museum! Lodging so far is our biggest “issue.” It’s so incredibly expensive that we are having a difficult time committing to anything yet. Lots of great tips in here. Thank you! Thank YOU Tiffany. Please be warned, The London Dungeon isn’t nice! I wouldn’t take my boys yet (6 and 8). Of course, The Science Museum is great, and the V and A. I just ran out of steam! London will always be home to me, I love it to bits, particularly the shopping. My boys are always talking fondly of Hamleys, they desperately want to go again. The London Museum in the City, not too far from St Pauls and is free. It has an excellent display of items from London’s past in chronological order. Well worth a visit and not too far from the Guildhall where you can see the remains of the Roman Amphitheatre and St Paul’s Cathedral. This is a fantastic summary of many of the things there are to do in London of particular interest for those travelling with primary school children. Thanks for that Suzanne, I value your input as a teacher and fellow London lover! I’ve never been to that one, maybe next time.